As Finding Nemo has taught us, fish are friends, not food. Unfortunately, some of the larger fish in the food chain still haven’t gotten the memo, as demonstrated by the aquatic themed Swap This! 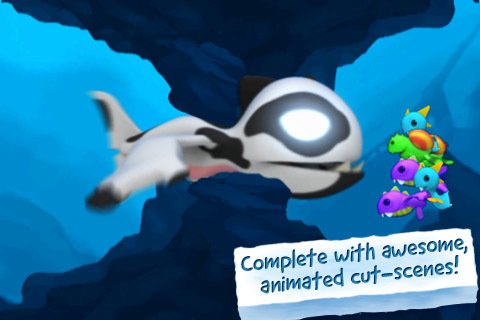 This colorful matching iPhone game introduces players to a bubbly but sometimes brutal underwater world where poor little fishies are trapped in ice cubes and must be freed if they are to escape the hungry jaws of some sinister predators. Admittedly, a new matching game probably isn’t going to make you jump up and down for joy, but Swap This isn’t your standard match-3. There are three playing modes, Fish Fight, Minute Match, and Puzzles. In all of them, instead of the familiar side-by-side swap mechanic, Swap This allows you to swap fish from anywhere on the board. 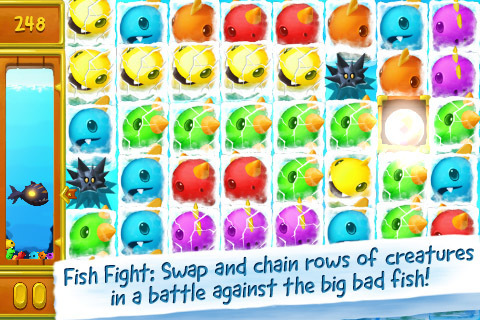 Make a match of four or more and the little colored fishcubes break and your finned friends can swim to safety. With Fish Fight, a giant fish is slowly rising to the surface. When you make a match, the freed group of fish will swim down and knock the big fish back a few notches. This doesn’t last long though, so you have to work quickly if you’re going to smash the big guy all the way back down to the bottom. In most cases, you’ll need more oomph than your plain old match-4, so you really have to concentrate on making big matches or combos. Unlike similar games, every time you make a match, you have a second or two to add on more matching fish, so you’re almost always in action, frantically trying to make an ever bigger match. If you manage to beat the giant fish, there’s a cute cut scene, another fish immediately takes its place, and you pick up right where you left off. With Puzzle mode, you’re just trying to clear the board in the fewest number of moves, and there are three difficulty levels. Minute Match works just about the same as Fish Fight, except instead of a hungry giant fish, you only get a couple of minutes to rack up as many points as you can. In Fish Fight and Minute Match, timing is incredibly important, as you have to be able to quickly assess a constantly changing board and try to line up combos on fly. Along the way, spiky, immobile sea urchins will show up to try to foul up the works, but there are the occasional special power-ups that allow you to either freeze urchins for easy moving or destroy them entirely. Two things to note about Swap This is that it’s a very attractive game, near to bursting with nice design touches and smooth animations, but it’s also a lot more stressful than I would have imagined for such a casual game. I would have imagined the pace to be tad less grueling and I was mildly surprised by the lack of an untimed mode. For the more competitive types, there are leaderboards, but no social networks aside from Facebook Connect. In the end, Swap This is just another casual matching game, so it’s not going to change anyone’s life, but as matching games go, this is a very, very nice one. It’s polished, professional, and dripping with fishy charm, which is about all you could ask for in a simple game like this one. AppSafari review of Swap This! was written by Tracy Yonemoto on March 7th, 2011 and categorized under App Store, Games, Puzzler. Page viewed 3407 times, 1 so far today. Need help on using these apps? Please read the Help Page.